Offense will be lead by a new head coach and quarterback system. First-year head coach Steve Addazio knows a thing or two about offense. Previously the offensive coordinator at Florida, Addazio brings to Temple not only a fresh batch of offensive enthusiasm, but also an impressive history of success. Addazio has 15 years of offensive coaching experience at the collegiate Division 1 level, including the last five years at Florida where he helped lead the Gators to national championships in 2007 and 2009. The veteran coach is hoping to harness the success of his past and channel it into another winning season for Owls’ football. WALBERT YOUNG TTN. Head coach Steve Addazio, hired this past December, will look to sustain the Owls’ recent success from past seasons. Per Addazio’s system, each position on offense has undergone a competitive position battle throughout training camp. The most heated battle during the preseason camp was at the head of the offense at quarterback, where five different players had fought for the starter spot. Redshirt-senior Chester Stewart and redshirt-junior Mike Gerardi both saw significant time as starters last year, but both struggled to protect the ball and neither did enough to secure the starting job. Stewart compiled a 5-2 record as a starter, but threw five interceptions and fumbled seven times. When Gerardi started midway through the season he displayed evidence that he can be a pure passer, as he threw for 1,290 yards and 10 touchdowns in five games. But, Gerardi’s tenure as a starter was tainted by eight interceptions in the team’s final five games as the Owls’ finished the season with a 3-2 record. Also, in competition for the starting job is sophomore Clinton Granger, who has been one of the more pleasant surprises throughout training camp. A transfer from Pierce College in Los Angeles, Granger has built a reputation among coaches as a quick learner and has impressed them with his natural ability. Sophomore Chris Coyer and redshirt freshman Connor Reilly have also been competing for reps. The multiplicity of quarterbacks that have impressed at camp combined with the fact that Addazio is yet to name a starter naturally creates the question of the possibility of a multiple-quarterback system. While Addazio has vehemently spoken out against giving more than one quarterback significant time in a given game, he has not ruled out the possibility of bringing a quarterback in off the bench in a wildcat formation or in spread offense situations. Addazio has stated that an official starter won’t be named until the season’s first game against Villanova. However, at training camp Gerardi has taken a majority of the snaps for the first-team offense and Addazio has hinted that Granger would be the most likely candidate to come off the bench and run the wildcat. In contrast to the mercurial atmosphere surrounding the quarterback position, the Owls have a clear-cut view of the 2011 season at running back. It comes in the form of 6-foot, 218-pound junior Bernard Pierce. Injuries and inconsistency marred his sophomore year and his numbers dropped across the board after an outstanding freshman. Now, injury-free and without the pressure of unfair expectation, Pierce is hoping to maintain his health and return to prime form. “He’s absolutely as talented [if not] more than most all running backs I’ve ever coached,” Addazio said of Pierce. Junior running back Matt Brown has overcome conflicts with the team in the offseason and will return to the backfield to create an impressive split-back system. At wide receiver, Rod Streater and Joe Jones will retain their starting positions for their senior years. Battling for the third and fourth spots are sophomore Deon Miller and junior C.J. Hammond. Hammond has a chance to play in what could be his first full season as a starter- he missed all of last season with a knee injury. Senior Evan Rodriguez will regain his starting role at tight end, where he caught 21passes last year. Rodriguez was one of 34 players named nationally to the 2011 John Mackey Award Watch List, which is awarded annually to the most outstanding tight end in college football. Another tight end competing for reps is senior Matt Balasavage, who played in 10 games last season with four starts. Also competing for playing time at the position will be four sophomores- Cody Booth, Matt Brookhart, Alex Jackson and Chris Parthemore -who all stepped on the field last year. New offensive line coach Justin Frye inherits a veteran group with versatility. Six starters return on the offensive line, all whom have started multiple games at different positions. Seniors Derek Dennis and Wayne Tribue will start at guard, junior Martin Wallace and senior Pat Boyle will play at tackle and senior John Palumbo will anchor the line at center. Once the question at quarterback is solved, this offense potentially has enough talent at running back and wideout to compete with any defense in the Mid-American Conference. 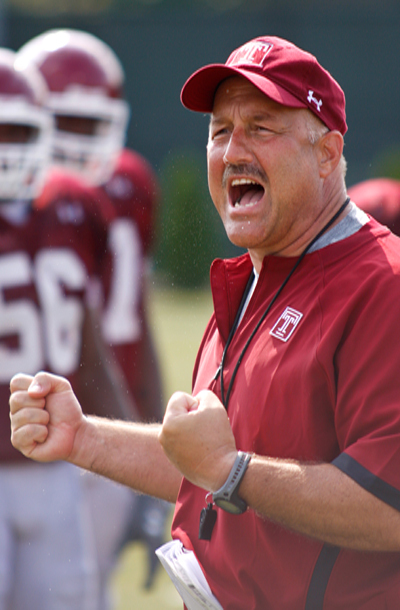 If Addazio’s history of success means anything, 2011 will be another step up for Temple football. “I think that what is yet to be determined is, are we at the stage where we can take this thing to the next level and that’s going to be determined on the playing field,” Addazio said. Joey Cranney can be reached at joseph.cranney@temple.edu. “Rise of the Tigers” is a film by two Temple seniors following a high school team from Kensington. Sophomore running back Bernard Pierce’s performance helped beat UConn, 30-16.